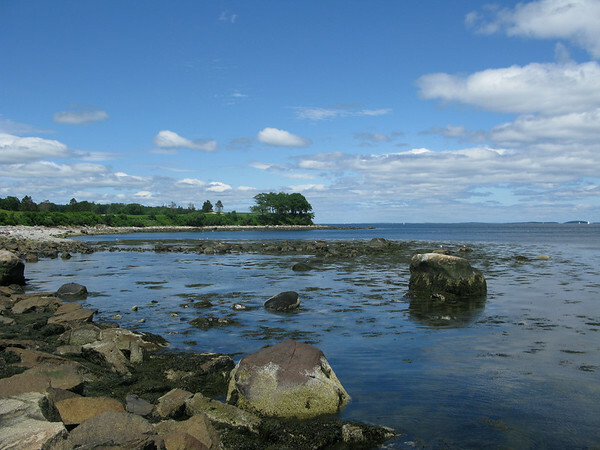 The town of Rockland sits on Midcoast Maine’s Penobscot bay. A perfect strolling town, lined by charming window displays of clever artisan’s works, sparkly baubles and puffin related souvenirs, Rockland brings to mind what a small American town should look like. No strip malls, no Burger King drive thru, no shiny officeplex housing a cubicle farm full of disgruntled workers. We walked along watching ice cream eating families laughing as they too walked. 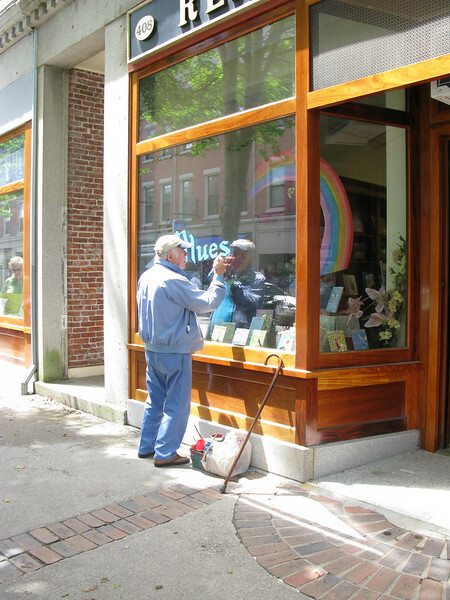 I couldn’t help but be completely enamored with watching an elderly man hand painting the lettering on a store window. The story that I built in my mind had him doing that very thing for the last 50 years. 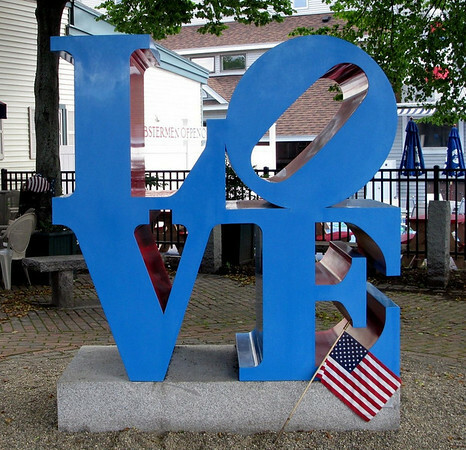 I was very excited to see that artist Robert Indiana, a Maine resident since 1978 currently has a featured exhibit entitled Robert Indiana and the Star of Hope at the Farnsworth Museum. While looking at one of Indiana’s quintessential LOVE sculptures on a street-side display I heard someone who is clearly not versed in art history say, ‘Hey, I know that sculpture.’ Such a reaction just serves to show the importance of the pop artist in the fabric of the public psyche. After a month or so of rain in the state, we were fortunate to have a big blue sky and warm weather for our day trip. 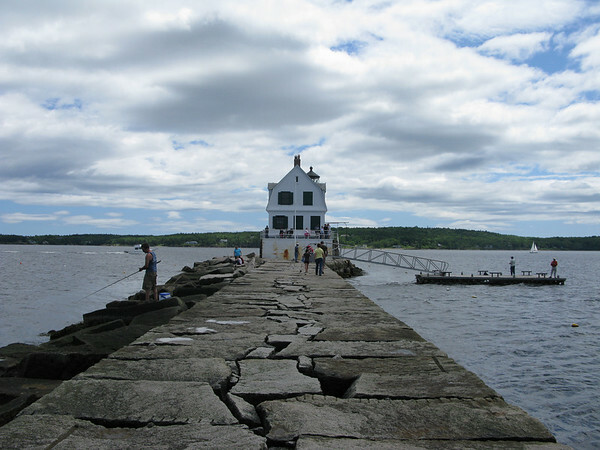 This gave us the perfect opportunity to comfortably walk the nearly one mile limestone breakwater out to the Rockland Breakwater Lighthouse. 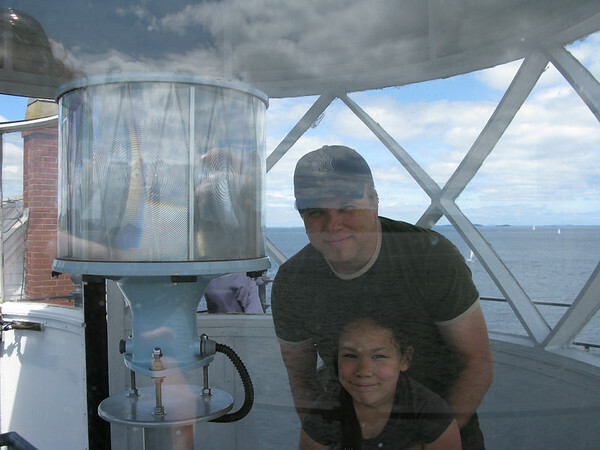 The lighthouse was open and free to climb up on its deck and finally up the narrow spiral stairs to the light tower. The last 5 or 6 steps up the ladder into the lens area are not kind to those afraid of heights but the view of the harbor and a watching a 1940s biplane from the Owl’s Head Transportation Museum giving a tour of the coast made the shaky legged trip back down the ladder totally worth it. Fuzzy Junior looks just like you. I hope she will someday write an entertaining blog like her mom. Seriously, you need to submit some of your writing to motorcycle or travel magazines. I always look forward to reading your blog. 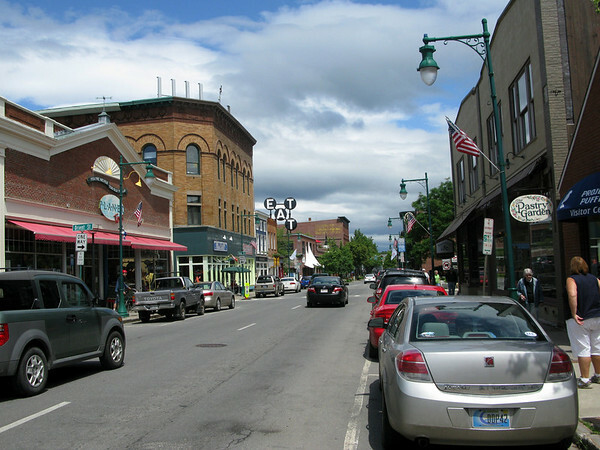 What a great town….we go there a lot and I never get tired of coastal Maine. Maybe this year, I’ll drag a bike along for a little excursion. Oh, and the Farnsworth was a genuine surprise to me, I had not expected it to be as comprehensive as it is. Wow, your comment made my day 🙂 That was really kind of you~ Thank you. Yea, lot’s of things to see off the beaten path. We try to go at least 1 new place every time that we visit the fam there. I really love being there.